Nose: Burnt golden syrup and honey jumbles make up the bulk of the nose. Crepes with brown sugar and lemon juice are also present. Quite a strong nose; both sweet and sour. The longer you let it breath, the more the crepes show up. Palate: The golden syrup from the nose comes through thick and heavy, without being burnt this time. The crepes with brown sugar and lemon juice are also still lurking in the back, although with much less lemon juice, and now with a trace of dark honey and a dollop of rich orange marmalade. Also the lightest trace of sweet oat biscuits and raisins. Possibly a trace of something spicy and sweet such as Kakadu plumb. Mouthfeel: Thick and creamy; almost chewy. Mellow, but with the slightest burn. Finish: Long. Pacific highway long. Still dark and slightly sweet; still heavy with golden syrup. A touch of menthol right at the end – just a slight touch. My mouth still feels like it is covered in a layer of this whisky for a long time. The fifth cask to be filled at the Black Gate Distillery, aged for three years in a single 100L sherry cask. Bottled in 2015 at 50% ABV with no chill filtration, and no colouring. Distilled in a direct fired copper pot still using local malted barley. Apparently there is a small amount of peated barley in this bottle – with the peat pinched from the Lark distillery’s stash down in Tasmania – although it must be an extraordinarily small amount of peat as I can’t really taste it, unless it is what is giving the golden syrup notes their burnt edge. 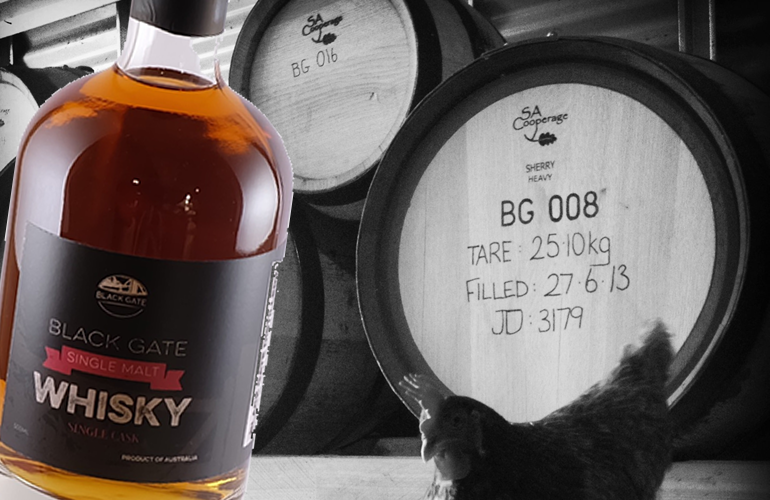 The Black Gate distillery is located in Mendooran, near the Castlereagh River in central west New South Wales (in Australia). The distillery opened in 2012, and also produces vodkas, liqueurs, and rums, along with whiskies. It is owned, managed, and operated by Brian and Denise Hollingsworth. Brian travelled extensively through Scotland, Ireland, and Tasmania (where he worked with Bill Lark – the godfather of Australian whisky) to research and learn the craft of whisky distillation prior to opening the distillery. In comparison to some of the behemoth distilleries in Scotland, Ireland, and the United States that produce millions of litres a year; Black Gate is currently running at full capacity producing a barrel of whisky every fortnight. This is not the most complex of whiskies, but is big, and bold, and rich, and to be quite honest; it is thoroughly delicious. If can get your mitts on a dram of it, I highly recommend doing so.